This church was started in November of 1976 and Steve Corbett was Pastor from May of 1977 until his retirement in 2016. It is a non-denominational, evangelical, Bible believing church that is affiliated with the Independent Fundamental Churches of America (IFCA). It is led by elders who are appointed to that position after significant training and observation. The first service was held on November 7, 1976 with 48 people in attendance. The following Sunday there were 25 and this became the nucleus of the future congregation. The attendance continued to build on a weekly basis. In September of 1976, Jim Ostewig, who was on the staff at the New Tribes Bible Institute in Waukesha gave Clyde Brogan the names of two couples in the Portage area who were interested in the establishment of an Independent Bible church in Portage. They were Jack and June Wynn and Erv and Mary Walker. Clyde and his wife Fran met with with them and they were excited and ready to give their support. They knew several other families who would be interested in such a venture. A couple of days later Fran and Clyde made a second trip from their home near Waukesha to Portage to look for a suitable meeting place. The search led them to a vacant church on MacFarlane Road that was for sale. Jack, Erv and Clyde made an offer to rent the building with the option to purchase at the end of three months (October - December). They felt this would give them sufficient time to judge whether a viable church fellowship could be sustained. The month of October was spent cleaning and preparing the building. A rummage sale had been held there in August and the remnants of clothing and other items that did not sell had to be disposed of properly. The unique feature about this congregation was that they did not start out by holding Bible studies which often continue for two years or more. The Walkers and the Wynns had faith to believe the time was ripe for establishing an Independent Bible church in Portage. The following article appeared in the Portage Daily Register announcing the beginning of services. PORTAGE - McFarlane Rd. 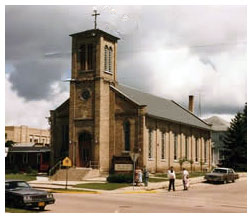 Bible Church is the name given to the new congregation in Portage. Services are scheduled to begin on Nov. 7 in the church building located at the corner of McFarlane Rd. and Carroll St. The project is sponsored by the Wisconsin Regional of the Independent Fundamental Churches of America. The Rev. Clyde Brogan, minister in charge is a graduate of Bryan College, Dayton, Tenn. and Dallas Theological Seminary, Dallas, Texas. He has had 25 years of pastoral experience. An informal fellowship time will be held between 10 and 10:50 the first Sunday. There will be an explanation of the nature and purpose of an Idependent Bible Church. Refreshments will also be served. Mrs. Brogan will present a Bible story during this time for the children. The worship hour will be at 11. Pastor Brogan will begin a series of messages on the New Testament book of Ephesians. The church conducted prayer meetings and monthly business meetings Wednesday evenings. Glenn Morris, the Child Evangelism Director in the area, and his family began attending. So he was approached about conducting the midweek services and supplying the pulpit on Sundays when the Brogans were unable to be there. In February 1977, Clyde Brogan made a trip to Texas and visited the campus of the Dallas Theological Seminary. While there he interviewed six students who would be graduating at the end of the school year, one of which was Steve Corbett. Out of the group he was the only one interested in ministering to a new congregation. Clyde made arrangements with Steve to attend the IFCA Regional Spring Conference in March at Waukesha Bible Church and to candidate at Grace Bible Church on the previous Sunday. The church later voted unanimously to extend a call to Steve. He and Rita began their ministry officially with the church on June 1, 1977. In the fall of 2000 we moved into phase I of our new building located at 2939 County Highway CX, Portage, WI.